Evidence of the esteem in which crystals were held can be found in a “remarkable set” of ‘crystal weapons’ found in the megalithic tombs of southwestern Spain. 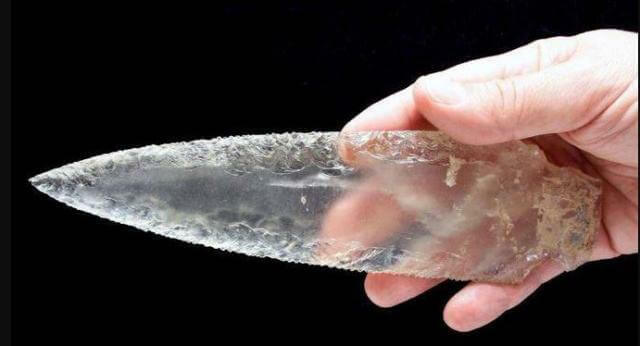 At the site of Valencina de la Concepcion, archaeologists have uncovered crystal arrowheads, an exquisite dagger blade, and cores used for creating the artifacts, that date to the 3rd millennium BCE. © Miriam Lucianez Trivino Dagger blade from Structure 10.049 (PP4-Montelirio sector). RTI images of side B showing striation caused by sawing and/or polishing. A: Zoomed-in area; B: Rendering mode: Diffuse Gain (Gain 39); C: Rendering mode: Specular Enhancement (Diffuse Color: 65/Specularity: 70/Highlight Size: 75); D: Rendering mode: Specular Enhancement (Diffuse Color: 0/Specularity: 100/Highlight Size: 142). © Miguel Angel Blanco de la Rubi Objects studied in this paper. A: Ontiveros arrowheads; B: Montelirio tholos arrowheads; C: PP4-Montelirio dagger blade (Structure 10.049); D: Montelirio tholos core; E: PP4-Montelirio knapping debris (from UE-345 on the left and UE-919 on the right); F: PP4-Montelirio micro-blades (from Structure 10.015 on the left and Structure 10.043 on the right); G: Montelirio tholos microblades. In this respect, however, it is important to note that, paradoxically, none of the most sophisticated artefacts studied in this paper can be ascribed to any particular individual: the rock crystal dagger from Structure 10.042-10.049 was found in the upper level of the main chamber (10.049) in which no human bones were identified; in Montelirio, neither the core nor the arrowheads can be ascribed to any on 20 individuals found in the main chamber; lastly, in the case of Ontiveros, the only available publication offers no evidence that the 16 arrowheads were associated to any particular individual.